If you are interested in running the project, there is some setup we need to do to create the database. I’ve kept it as simple as possible. The example is created solely with Visual Studio 2013 Community Edition which is free for individual developers and small companies. 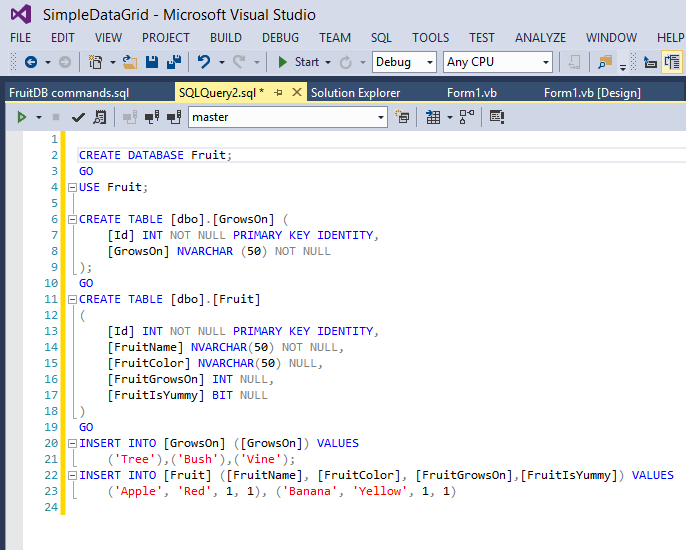 You don’t need to install SQL Server or SQL Server Management Studio. Step Two – open a new Query. If you use SSMS, this will look familiar. 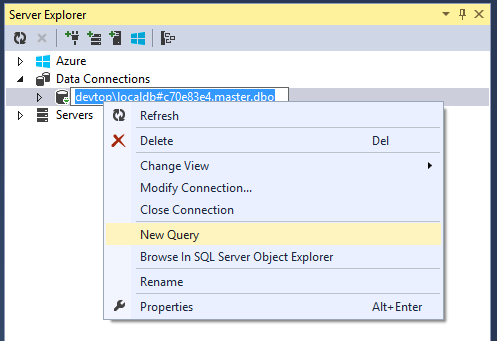 When the query window opens you should be connected to the [master] database. Now copy the following script (or open it from the project) into the editor and execute it with the green “play” button or cntrl + shift + e. If you press F5 it will run your program, so for SSMS users, this change in execute shortcut will take some getting used to. A common mistake by newbies is to add and remove rows from the grid, and change cell values and read cell values then update the database. DON’T! You want to manipulate the data source, not the grid. Data binding will handle the changes to the UI. A DataGridView has been dropped onto the default Form1 designer. I used the designer to create the grid columns that map to the [Fruit] database table we created. Notice how the column types are set to match the data types in the database. I intentionally used more than just text columns to demonstrate CRUD with checkboxes and comboboxes. Now for a whole lot of code. I have heavily commented the source code to explain everything. Depending on just how new you are to programming, you may have more questions, just leave a comment and I’ll get back to you. All of this code is in the code-behind of Form1. It doesn’t necessarily demonstrate best practices, but it is a good place to start when learning how to data bind. 'A DataAdapter gives us the ability to get data from a database and send changes back to the database. 'The DataTable that will actually contain the data that the GridView is displaying. 'there to facilitate binding the [GrowsOn] field of the table. 'First get data into the combobox datasource and bind it. 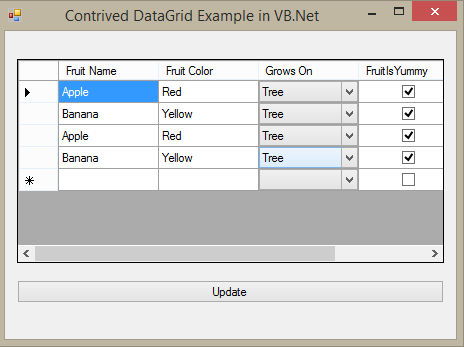 'Now get all data from database in table [Fruit] and bind the grid. 'stored procedure or Entity data model. Dim cmdString As String = "SELECT [Id], [GrowsOn] FROM [GrowsOn];"
'the ValueMember and DisplayMember properties. 'and which column is the value to display to the user.
''' Binds the DataGridView and sets up all the plumbing to Insert, Update and Delete.
''' This is a lot of work and can be done without code but it is good to understand how it works. 'Sets the appropriate properties on the grid columns to accept data binding. 'Add commands to the DataAdapter. These should be stored procedures in production. 'want all rows from the database.
''' then demonsrate how to get a reference to a specific column in code.
''' Clean up some resources.
''' of inserts, updates and deletes. Thank you so much for the answer in stackoverflow ! 🙂 this is really a great example for beginner clean and easy to understand ! If I mod DC1 and/or DC2 and/or DATE I have no error and works fine. Generally key fields should never be updated. Rather than trying to work around the concurrency violation, I suggest you delete the row and add a new one with the values you want. Thank you very much, it really helped me to understand basic CRUDE 😀 . My question about the the Fruits & GrowsOn table. Although both of the table have “id” column but it is not connected in database diagram. So does it mean its not mandatory to define foreign key or relationship? While it is advisable, it is not necessary to define foreign keys. You can join any columns, even if they don’t have a relationship. I didn’t bother creating that relationship for this toy project but I always do in production systems. in the bindgrid subroutine comment, you said it could be done without a code. Does it mean by using wizard? Yes, you can define columns and bindings in the UI but that is not so easy to do in a blog post without a video or animated GIF.